I hope everyone had a nice weekend! My one-year wedding anniversary was Sunday, April 2nd, so my husband and I had a nice long weekend of hiking, eating, movie watching and petting cats. And as a disclaimer, I did NOT eat paleo this weekend! Friday morning we set out early at 7:00am and headed to Cafe Java in Round Rock to fuel up for the hike (they don’t have a website). This is a favorite breakfast spot of ours, but we don’t go very often because they’re usually pretty busy on the weekends. Luckily we went on a Friday morning and didn’t have to wait. I usually order a house coffee and the Scrambler, but on Friday I ordered three breakfast tacos (chorizo, bacon and sausage) and a side of hash browns, and my husband and I both ordered the “Butterbeer” on the featured drinks menu, which was pretty tasty. It seemed like a lot of food, but I would be glad that I ate so much later on during the hike. We then started the long drive out to Enchanted Rock State Natural Area. The drive there was really pretty, the bluebonnets were in bloom and there were tons on the sides of the roads. Once we arrived, we applied our sunscreen, put our backpacks on and started walking. We decided to do the Summit Trail first before hiking the other trails, because we didn’t want to have used up too much energy before the steep climb to the top. And it was pretty steep. My heart rate was elevated the entire time and my calves were burning. It was also very windy, and the higher we got, the stronger the wind felt. I could barely hear myself when I spoke, and I was really mad at myself for leaving my hair tie in the car. Once we got to the top, we stopped to take in the view and get some photos. It was really beautiful, you could see out pretty far. Then we climbed back down and started out on the other trails. We had a plan of taking the loop trail towards Frog Pond and then taking the Turkey Pass Trail towards Echo Canyon so we could see Moss Lake, but things didn’t go as planned. We started on Loop Trail and ended up crossing Sandy Creek thinking it was Frog Pond. Once we got to the actual Frog Pond, we looked at the map and came to the conclusion that we needed to take a left to continue onto the Turkey Pass Trail. But we ended up right back where we started at the Gazebo. Looking at the map now, I can see what we did, but it would have really been helpful if the trail was marked. We weren’t sure what to do at this point, and how much longer we wanted to be hiking, but we decided to hike back up Summit Trail to the Echo Canyon Trail and follow that to Moss Lake. There are little markers with arrows along the trail, but they are not in the places where you would need to know which way to go. There were quite a few times when we weren’t sure if we were headed in the right direction or not since it’s not really a definitive trail, just rocks. So we would stop and look for one of the little arrows, but couldn’t find one. So we’d keep walking in one direction until one of us spotted an arrow. We finally got to the area where Echo Canyon trail was marked. This trail was pretty difficult, and a lot of rocks that you had to climb. We had to go slow. Again, there were a few times when we didn’t know if we were going the right way or not. Also, there are a couple of trails that weren’t marked on the map that we had, so we had to guess at where we were. We finally reached the Outhouse on the map and thought we knew exactly where we were. There was also a map on the trail with a “You are Here” marked. We were pretty sure that this meant that we needed to keep going until the trail split, and when it split we would take a left to go towards the lake. We got to where the trail split, and took a left. The trail got harder and more difficult to find, and there was an image on the marker that said this was for rock climbers. We decided we didn’t want to continue on the trail. We were tired and starting to get hungry, so we turned back. At this point we ran into a woman who was also lost, and after talking with her she let us know that the lake was in the opposite direction. At this point we had no idea where we were on the map or how we ended up in the opposite direction we thought we were. We needed a compass. We continued on toward the lake, and when we reached it things got more confusing. There were two areas with forks in the road. There was another “You are Here” sign, but it was still hard to tell what side of the paths we were on and which trail to take since some of the trails weren’t on the map. We thought it might be easier to find our way back to the loop trail or base trail, which would probably be more level than the rocks we climbed on Echo Canyon, but couldn’t tell which way to go. We followed a set of arrows and ended up at the camping area sign. We went back to see if there were any other marked trails and to read the map again, but were still confused. So we went back and walked past the camping sign a while before we finally found an arrow. We somehow found our way back to where we were and went back the way we came, the Echo Canyon trail, which was a lot quicker going back since we were going uphill. At this point we knew where we were going and found our way back to the start. Boy we were glad to get back to the car! My feet were tired, and my knees and calves were sore. 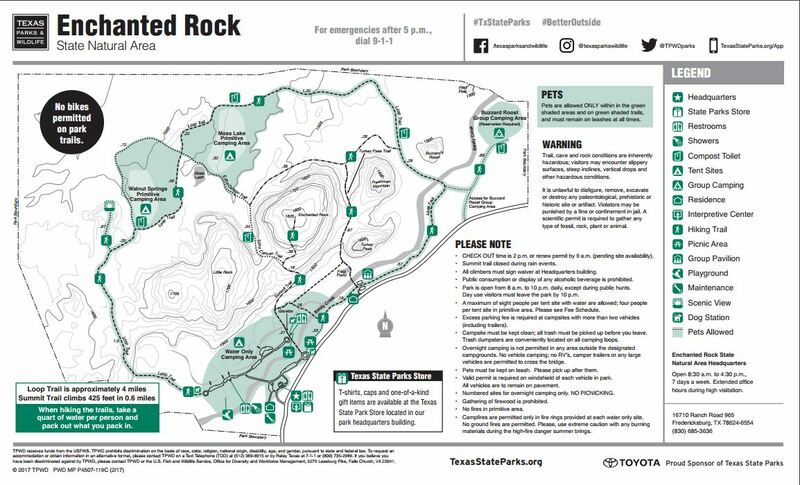 Enchanted Rock is a beautiful park, but very confusing to navigate around. It would be helpful if the trails were marked better. The little arrows were mostly posted in the areas where there was a definitive tail and it was pretty clear which way to go, and not in the areas where they needed to be, where there wasn’t a clear trail. I also think that in addition to the arrows there should have been trail information. The arrows let us know we were on a trail, but it’s not helpful if you have no idea which trail you are on. And there were a few times when we thought we were on one specific trail but ended up being on a trail that wasn’t even on our maps. It’s very easy to get lost at Enchanted Rock, and we ran into a few people who were lost as well. I definitely wouldn’t recommend hiking it alone. We ended up hiking around 8 miles, and according to my FitBit I climbed the equivalent of 116 flights. I didn’t realize how famished I was until we arrived at Cooper’s Old Time BBQ and smelled the food. We chose to eat there at the Llano location because it is on a lot of “Top BBQ Places” lists, and we love BBQ. We ordered half a pound of brisket, half a pound of ribs, a peach cobbler and a blackberry cobbler. We had a couple of people ask us if we ordered more than we could handle, but we ate every last bite. To be honest, the BBQ was good, but it tasted a bit too salty. My husband and I both commented on it when we got back to the car. We could have just been there on an off day though, and maybe the cook sprinkled a little more salt than usual onto the meat. The cobbler and the beans were delicious. But if I’m judging the BBQ I would prefer somewhere else like Salt Lick. On Saturday we had a plan to go into Austin and eat breakfast, go rowing, visit the cats at the cat cafe, then come home and rest a bit before heading to a movie. We planned to eat breakfast at Snooze Eatery (I’ve been to the one in Colorado and loved it), but we got a late start and once we got there it was pretty packed. So we headed to 24Diner instead, where we only had to wait 15 minutes before being seated. I ordered the french toast platter with bacon. I like 24Diner because the food is local, natural and nitrate free. The french toast was delicious, and the eggs and bacon tasted very fresh. David ordered the fried chicken and waffles. The chicken tasted great, but we both agreed that the waffle had a slight beer taste to it. I’m not sure if the batter is different for the chicken and waffles platter, but it was slightly off-putting. Otherwise everything was delicious. The weather wasn’t the best for rowing since it was cloudy and there was rain in the forecast, so we found something different to do. We stopped into Whole Foods and got a couple of Lemon Love Suja Juice’s to quench our thirst and then went to the Austin Toy Museum. This was a lot more fun than I thought it would be. It was a small little museum in Austin, but they have a ton of old, classic toys and game systems. We got a sense of nostalgia seeing the old toys of our past. This is cool for any kid that grew up in the 80’s or 90’s to see. There were toys and games that I had completely forgot about, like the California Raisins, Polly Pocket, Pound Puppies, Teddy Ruxpin and more. We spent some time playing Duck Hunt, Sonic and Knuckles, Street Fighter and Q-bert. After that we drove a few blocks over to Blue Cat Cafe. We have been wanting to visit this place since it opened. Of course, being the crazy cat people we are, we loved this place. The food is all vegan and has a lot of soy, so I couldn’t eat anything. But we didn’t go there to eat (we were still full from breakfast anyway). We ordered a couple of coffee drinks – I got the Pep-purr-mint Mocha with Almond milk – and watched all of the cats. I thought this was a great place for cats. There were cat trees and shelves up all around, which gave the cats plenty of places to climb and run. It looked like fun for a cat! They sell little bags of treats for 50 cents (we didn’t get one), so the cats were probably happy getting lots of treats and pets. A black cat named Larry jumped up on our table and hung out with us for a while, up until he saw someone with a treat bag. They were very sweet, well-behaved cats. All of the cats were up for adoption. They also had a gift shop with things for both humans and cats. We of course couldn’t visit a Cat Cafe and pet a bunch of different cats without bringing something back for our own. We bought our cats a bottle of Purrgundy Cat Wine, which got them a little tipsy (there is catnip in it), and a new toy that they love. In the evening we headed to iPic to watch a movie and eat. iPic is always a fun experience. It is an upscale movie theater with recliners that serves food. The recliners are very comfortable, and come with a pillow and a blanket as well. The popcorn is complimentary with your ticket, and tasted really good, better than other theaters. I think there was a hint of sweetness to it. We ordered the Buttermilk Fried Chicken and the Pulled Pork Sliders, and both were really delicious. The Chicken came with two dipping sauces, a bacon maple and a sriracha ranch. I don’t know which I liked better. I would definitely recommend visiting iPic in Austin if you haven’t. It’s pricey, but a great experience. On Sunday for our actual anniversary we got a little dressed up and had a nice three-course meal at Olive and June. They have a Sunday dinner special which comes with three courses and is $36 a person, but we decided to order off the regular dinner menu. We loved this place! Everything we ate was delicious and the service was great. I don’t know much about Italian food besides the more well known dishes, so I wasn’t sure what a lot of stuff on the menu was. Our waiter was very helpful and answered all of our questions. He was attentive but not pushy, and didn’t hover. We started out with a glass of Pinot Noir and the pork meatballs. The meatballs were great, the marinara was tasty and there were figs cooked with it which added a really nice flavor. The bread they bring out had a sauce of olive oil and ricotta cheese and spices to dip it in, and we asked for more. We didn’t do a full three courses, we each ordered something from Antipasti and Secondi. For the Antipasti we ordered the Red Leaf Salad, which had ricotta, dried cherries, pepperoncini, shallots, and balsamic vinaigrette. The flavors paired nicely and the balsamic vinaigrette and ricotta were great. For “Secondi” we ordered the Seared Branzino, which is a European Sea-bass with Texas field peas, smoked pork belly, hazelnut and sweet potato agrodolce (which I had to ask what it was–basically a sweet and sour kind of sauce). This was delicious! We both absolutely loved it. For dessert, we ordered the Chocolate Pear Tart which was topped with hazelnuts and gelato and a chocolate sauce. It was great and we enjoyed every last bite. We both loved this restaurant and will be back. Maybe not frequently, since it was quite pricey, but it was a great restaurant to eat at for a special occasion. They also have complimentary valet (we tipped them). Once we got home, we broke out our year old wedding cake for the tradition. I had placed it in the fridge to thaw out the day before. I wasn’t really looking forward to eating it since I didn’t have too many friends that enjoyed their wedding cake a year late, but I was surprised. It was still really good! Cathy, the owner of the venue we chose for our wedding and the maker of the cake did a great job wrapping it well so it was well preserved and didn’t have any freezer burn, and the inside was still moist. I’ve read that if he cake is preserved right that it will still taste good. Ours was preserved right. We placed the rest in the fridge to be enjoyed this week. I knew I wasn’t going to be eating paleo over the weekend and that I would be indulging in some things with gluten and dairy that I wasn’t used to. So I bought some of these Zenwise Digestive Enzymes to help me with any tummy issues I might have. These really helped! I have talked about these before in my entry about Reversing the Physical Effects of Bulimia, but they are awesome. I normally would have felt pretty horrible after eating everything that I did, but I didn’t feel as bad with these. I did have some slight acid reflux, but I think that was more from the amount of food that I ate (because it was a lot). Sadly, although it helped with my stomach issues, it didn’t stop my face and lips from itching and my acne from flaring up. Overall it was a fun active weekend, and a great way to spend our first anniversary together. We like being active and doing outdoorsy things together. I’m glad we decided to do the hike on Friday before the rain came, it was a beautiful day for the hike. I would recommend every place we ate, but if you hike Enchanted Rock make sure you go in with a plan, or a compass!